What makes a brand a "luxury" brand? Is it the quality of the materials? The design? The price tag? Yes, yes, and yes - but if these were the only criteria, everything from smartphones to well-made running shoes would be considered luxury items. The key to luxury is and always will be centered around an idea of exclusivity - the feeling that not everyone will be able to get their hands on or experience whatever it is that the brand is selling. However, while this feeling is usually evoked through perceptions of quality, comfort, and elegance, the term "luxury" is evolving to encompass several additional things to consumers around the globe. "Luxury" has a different meaning today than it did to previous generations. Last year, Marriott International and Skift Research conducted a worldwide survey of more than 5,000 high-income luxury consumers to capture attitudinal and behavioral differences toward luxury across the US, UK, China, Mexico, and the United Arab Emirates. 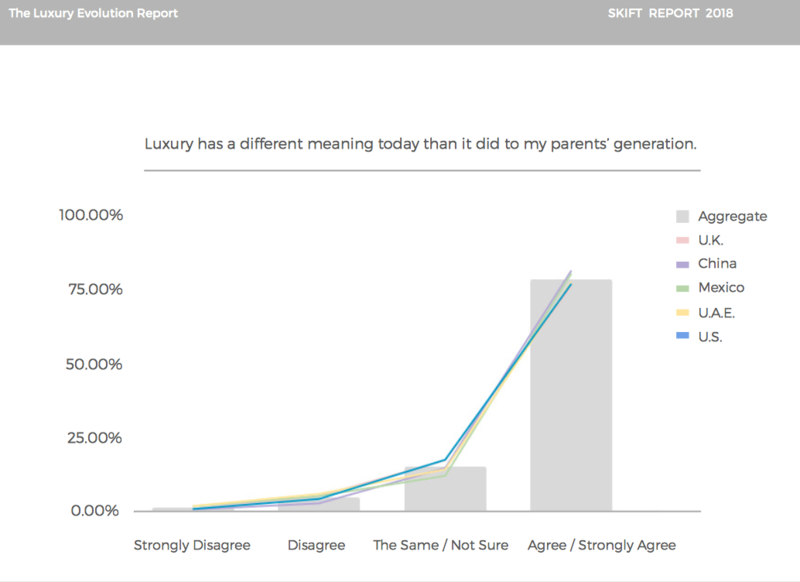 One of the key things to emerge from the study was that roughly 75% of respondents across all markets said that "luxury has a different meaning today than it did to my parents' generation." Globalization, combined with the disruptive impact of the internet and digital technology, is creating a much broader, multidimensional perspective on what quality, luxury, and exclusivity can be. Though high-income luxury consumers still cherish long-held concepts of luxury - such as quality, comfort, and elegance - around the world, they are doing so through the prism of a new set of aspirations and lifestyle goals. One key takeaway from the survey revealed that high-end consumers use luxury purchases to differentiate themselves from peers. While this isn't particularly surprising and hasn't changed much from previous generations, it was also found that today's luxury consumers believe that not all luxury purchases are necessarily the most expensive, signifying that the bragging rights they seek don't necessarily center around their ability to make exorbitant purchases alone. 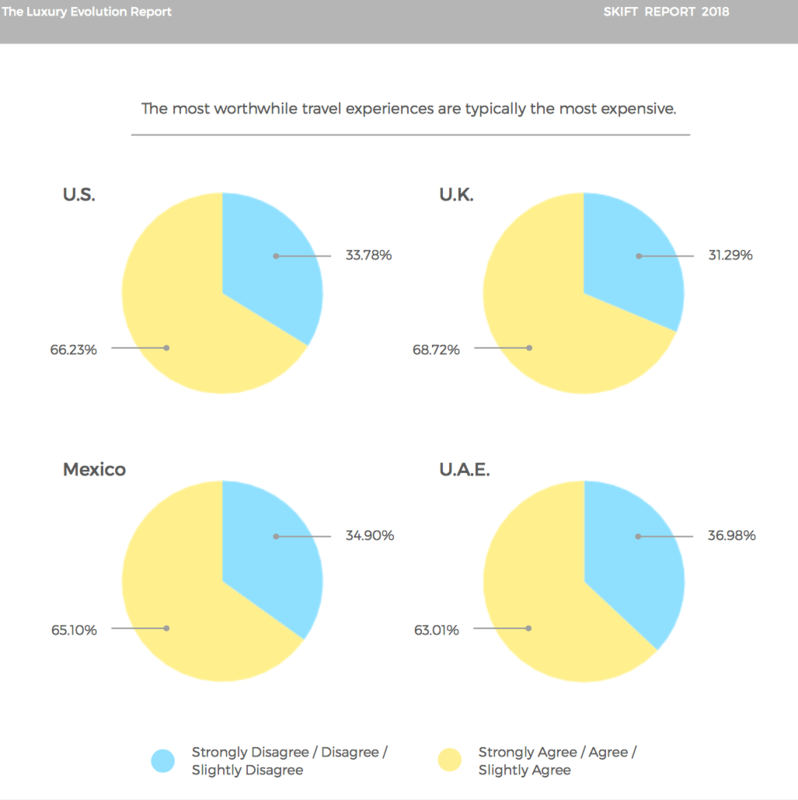 For instance, a significant minority of respondents - about one-third across all markets - disagreed that the most worthwhile travel experiences typically cost the most, suggesting that a re-evaluation of priorities is taking place. As Tina Edmundson, Global Brand Officer at Marriott International, puts it: "Our guests are seeking out experiences that help them express who they are, so their approach to luxury continues to be less formal, entirely more personal, and defined more by their interests and mindset than their geography and demographic. They want more than just to trust a hotel brand. They want to align with a company's brand pillars, more consciously than before, that advocate for their priorities." One example of a luxury brand catering to its luxury customers' personal aspirations is W Hotels, which has long-embraced values like diversity, inclusivity, creativity, and openness. For example, the hotel brand's "Turn It Up for Change" event series - produced in partnership with the Human Rights Campaign - involved monthly music events to promote awareness of LGBTQ rights and marriage equality. "W Hotels is a good example of a brand to which luxury consumers are increasingly drawn because it communicates a sense of purpose beyond just existing to sell something," said Edmundson. The concepts of self-actualization and personal fulfillment indeed appear to be at the heart of what high-end consumers want and expect from "luxury" experiences today. As Skift and Marriott's research reveals, more than 75% of survey respondents across all markets either agreed or strongly agreed with the statement that they find "more value in goods and services that enable them to learn something new." As the report notes, this, once again, implies a shift in priorities from notions of "what you can do" to "who you can be". In addition, luxury consumers also want to be seen as "early adopters" of new technology. 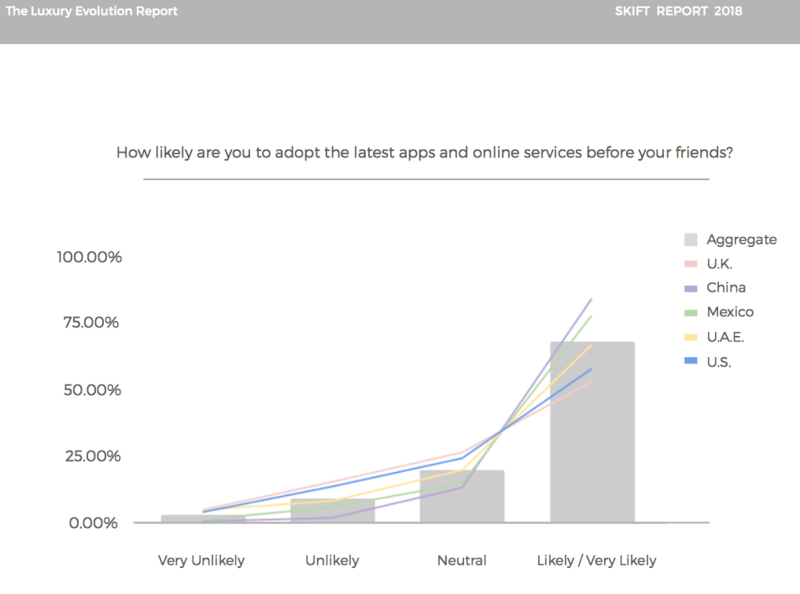 Over half of respondents in the US and UK, and two-thirds or more in China, Mexico, and the UAE said that it was either likely or very likely that they would "adopt the latest apps and online services before their friends." For luxury brands, this means that it is becoming increasingly important to go beyond simply providing the "status quo" when it comes to the tech services they offer. Affluent consumers are looking to differentiate themselves from others through being "ahead of the curve" in the technology they use, so brands need to appeal to these desires by being on the cutting edge of new tech tools and applications. Affluent consumers may be spending more on luxury goods and services than ever before, and they may still be using these purchases to help shape their identity - but, increasingly, luxury is no longer defined only by concepts of quality, comfort, and elegance. Indeed, luxury expenditures are today going well beyond products that are expensive, produced by coveted brands, or simply hard to get hold of. Instead, there is a shift from the external to an internalization of what is considered to be "luxury". Today's high-earning consumers are looking for experiences that help them learn, differentiate themselves, express who they are, and have a purpose beyond comfort and pampering. Technology is playing an increasingly important role in this, and luxury brands will do well to ensure they are incorporating emerging tech - such as artificial intelligence and augmented/virtual reality experiences - into their offering.